Speaking to Brenda Elsey, who is in Buenos Aires, covering the sports and politics story that demands more attention. Brenda Elsey is an associate professor of history at Hofstra University and co-host of the sport and feminism podcast Burn It All Down. She recently wrote an article for The Guardian, “From the Ashes, South American Women Rise Again For the Copa America Feminina,” about female soccer players in Brazil, Chile, and Argentina and how they have changed their federations by self-organizing themselves. This interview has been edited and condensed for clarity, and you can listen to a longer version of this interview on the Edge of Sports podcast, sponsored by The Nation. Dave Zirin: Can you give us a sense of what the women’s soccer federations looked like in Brazil, Chile, and Argentina before the players started organizing? Brenda Elsey: In 2014, when the last Copa America was held—which is the only time you really get to see these federations come out—it looked like there was some momentum, some kind of organizing in all of those places. The president of the federation at that time, in Chile, was really interested in developing the women’s game. He’s since been displaced. Brazil has such a depth of talent that they can maybe get by without much support sometimes. And Argentina was a disaster, as it is today. So in 2014 you saw them go to Ecuador. There was some momentum around them at that time, and then, between then and now, it was a complete disaster. The majority of teams in CONMEBOL [The South American Football Confederation], six out of 10, sometimes seven out of 10, were considered inactive by FIFA. DZ: How have the players organized to turn this around and how much have they turned this around? BE: I think it’s amazing how much they’ve turned it around. This tournament, so far, has been better than we’ve seen. They’ve gotten, just by their own efforts, a TV station in Chile, for the first time, to cover the tournament, entirely. The stadium attendance is record-breaking and they’ve done it through really political organizing, collective political organizing, in different ways. The Chileans have formed a union. This happened all around 2015, 2016, during the whole FIFA scandals when they really fell into complete disarray. Meaning, their federations weren’t even answering invitations, so they might’ve been invited by the Colombian federation, but the Chilean women didn’t even know. They didn’t have coaches. They didn’t have anything assigned. And so around then, they really started realizing, hey, after all this work—because most of them had gone through the system as youth players—and they saw their rankings go from 15, 16, to 0, at the end of 130. So they really got together around 2015-16 and they’ve done it in different ways, but collectively, the Chileans, like I said, they started a union. The Argentines went on strike. And the Brazilians had a collective combination of letter-writing and, sadly, and this is so painful, retirements. DZ: Brazil, Chile, and Argentina, three very different countries in so many different respects. Has this been the sort of thing where this kind of organizing has happened on parallel lines because of just facing similar circumstances? Or have there been interactions between the players in these different countries? BE: No, this has happened in isolation from each other, but in connection to a larger feminist revitalization that’s happened over the last two years, continentally. So more than anything, it’s not really about soccer, so much as they’ve been connected in different ways to transnational feminism. The Ni Una Menos [Not One Women Less] movement in Argentina, in particular, which has spread across the continent, is a protest against gender violence, but it’s taken on a much bigger platform since it first started. In terms of understanding gender violence as not only physical. You saw this on March 8, just huge mobilizations in Buenos Aires, Santiago and Rio, Sao Paulo, so they’re connected in that way, but as of now, they’ve not gotten together as women’s soccer players. We’re trying really hard to make that happen, following the Cup. A lot of people are trying to work and do grant writing and do things like that, but it’s really difficult, they don’t have the funds to do that. DZ: Have the women’s soccer federations in Brazil, Chile, Argentina, received support from non-sporting organizations, civil-society organizations, leftist groups, women’s groups who are involved in the mobilizations? BE: They’re just starting now. That’s something that first they needed their own organizations in order to be able to reach out. And now that, for example, the Chilean players’ union exists, they’ve formed a relationship with the men’s players’ union and they’re both in contact with labor unions. It’s happening right now, but it’s [just] happening. DZ: And, you reference neoliberalism in the piece. Can you give us a sense of, first of all, how you define neoliberalism and the intersection of neoliberalism with this effort by the women to organize themselves and reclaim soccer in their country? DZ: Has the shift right provoked or inspired these movements? BE: It’s hard to say. I mean, I would like to say yes. I would like to be hopeful and optimistic that it’s done that, but the push right, there’s always a pretty strong back and forth, as you know, in this region and what’s happening in Brazil, it’s hard to even put such a kind of handle on that, right now, but certainly the movements around [the assassination of Rio de Janeiro city councillor] Mariella Franco and the assassination of some of these leaders has sparked indignation and a lot of organizing. I’m only in Argentina, most of the time, right now. From what’s happening here, there’s a ton of mobilization happening in the universities and the cities with the main worker’s organization. There’s just a lot of activity. One that’s really reaching out to feminists in a real way and being led by feminists, which wasn’t the case in the 60s and 70s. DZ: How did you come to even know about the story? And so I went to ASA headquarters to watch them train and nobody else was there. And it was just remarkable. I just started talking to them and it was just painful what they were willing to do to wear the Argentina jersey. What they were willing to sacrifice in their own lives and how just being here, in Argentina, where there’s no coverage. Even today, I looked for something. Today, Argentina plays Venezuela and nothing. It was just really moving, to me, what they were willing to do. And then I got to know and look at all this organizing they’re doing. DZ: How open are people with you? Is there any fear of danger or backlash the way political athletes in this country, invariably, are concerned about those issues when they speak to researchers, historians, reporters about struggle and using sports as a platform for struggle? With the biggest players, it’s harder because they have more of a public image. A lot of them play in the National Women’s Soccer League. Some play as far as South Korea, so they have kind of professional advice that they’re getting so they’re a little bit more closed, in terms of wanting their name. They’re not closed, personally. They love to tell you, because they’ve suffered, but they’re a little more closed when going on record. DZ: Where do you see this in the next period? BE: I think the next step is a regional association. 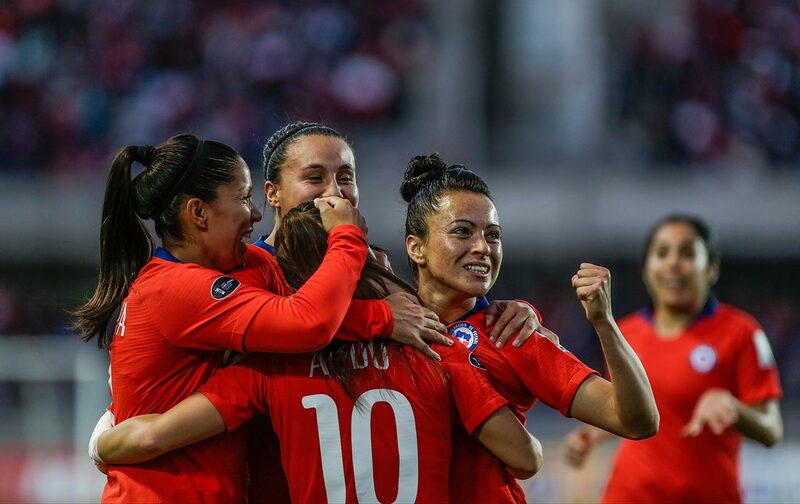 Right now, there’s not a regional association, and so what we’ve proposed, because I’ve been writing grants with them over the last couple of months, is a big forum for CONMEBOL women in August, in Chile. So we’re hoping to build on the momentum of what’s happening now and then try to get them together because they have no time. At the Copa, their schedules are so tight and the funds are so limited that once their eliminated, they have to immediately leave. So, even when we try to like set up a coffee or cookies, something, it was nearly impossible. So we’re hoping in August, to set something up like that. I think the women, especially in Brazil, Argentina, Chile, but also Colombia which has a new womens’ league and I didn’t get to talk about them in the article because there was just no space. But the Colombian women’s league has been incredible and their performance in the tournament absolutely is a reflection of how successful that’s been in the first year. So I think that’s really heartening. I think the next step is to create real structures so that there’s problem-solving sharing. A way in which there’s a public call to action, but also a way in which all of this activity gets focused and institutionalized in a certain sense. DZ: Is there anything I’m missing in terms of this story? BE: I think how great the tournament has been! It’s been fantastic. The one thing is I wrote that article and it has a political bend to it, but it has this amazing sporting event, a really high-scoring tournament that averages like four goals per game. It’s pretty unpredictable. There’s been some amazing performances like Catalina Usme from Colombia who’s just tearing it up, tearing it up. Andressinha from Brazil, she plays for the Portland Thorns so a lot of these people that are playing right now, probably a lot of your listeners can see them…. Estefania Banini from Argentina, she plays for Washington Spirit. So a lot of these players have come out and they’re excited and it’s been evident on the field. There’s been a couple on-field protests and that’s been exciting and interesting to see the Argentine players do this kind of gesture after they make a goal which is kind of cupping their ears, like, “I can’t hear you. I can’t hear the love that I should be getting right now.” An older gesture that goes back from men’s play. So there’s a lot of creative stuff on the field and it’s been a beautiful tournament.